Click to see the website of the Konstancja and Restauracja Hotel. 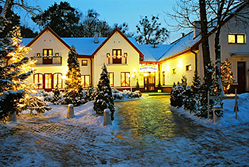 The hotel and Restaurant with the same name "Konstancja" is open from 1993. The complex is active as „Uzdrowiska Konstancin Zdrój” Sp. z o.o. 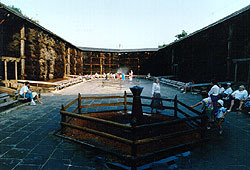 Konstancja" located by salt spring chimney cooler, which heal the nervous and inhaling system. The environment of the Park looks very nice in every season of the year and in spring and summer the park is very much alive, therefore the season here lasts throughout the year. 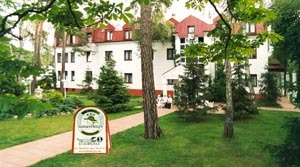 It is a quiet and pleasant place far from the city noise, recommendable for the business trainings as well as rest. We have the pleasure to offer you a 10-day package in our rooms equipped with a bathroom, TV Sat and telephone. Breakfast buffet and dinner are included. The price is only 120 PLN per person/day. Hot Offer! Discount up to 50%!!! From the Int. Airport "Okecie" - Zwirki i Wigury Street, through Hynka to the Southern Bus Station. Afterwards using busline 710 from Wilanowska Avenue to Wilanow and finally across the Powsinska Street to Konstancin.